Acute or chronic arthritis, rheumatic neuralgia, acute or chronic tendonitis, sciatic neuralgia, lumbar and leg pain, lumbovertebral hypertrophy, osteoproliferation, injuries from falls and blows, sore muscles from over-exertion. 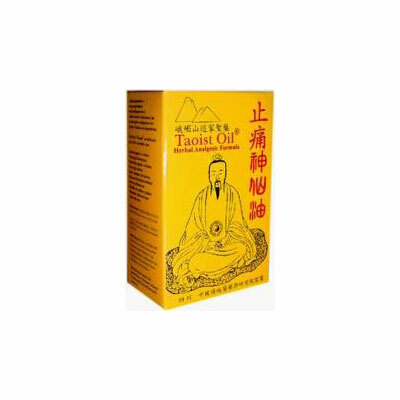 Taoist Oil has its origin in the E Mei Mountain’s Chun Yang Taoist Temple. For centuries, the temple secretly held Dr. Sun Si Miao’s analgesic herbal formulas, which were regarded by Taoists as sacred medicine. Sun Si Miao is Tang Dynasty’s most renowned Taoist herbal doctor. History indicates that Sun Si Miao’s accomplishments and contributions in Chinese Herbal Medicine were legendary and Dr. Sun was often regarded as the ‘King of Herbal Medicine’. Taoist Oili s the result of repeated clinical trials with one of Sun Si Miao’s formulas. Adjustments and modernization of processing techniques were made to the original formula to further its clinical effects. Apply to affected area once or twice daily. It is unnecessary to rub or work liniment into skin. To test for skin hypersensitivity, apply a small amount onto skin. If irritation occurs, discontinue use. Wash hands thoroughly after each use. For external use only. Do not contact liniment with eyes or any other mucous membranes. Avoid use during pregnancy. Do not apply to open cuts, sensitive areas, or genital area. After applying liniment, do not wrap or cover area with occlusive bandage or clothing. Keep this and any other medicine away from the reach of children.